Some of you must be gasping right now. “What about the Mona Lisa? 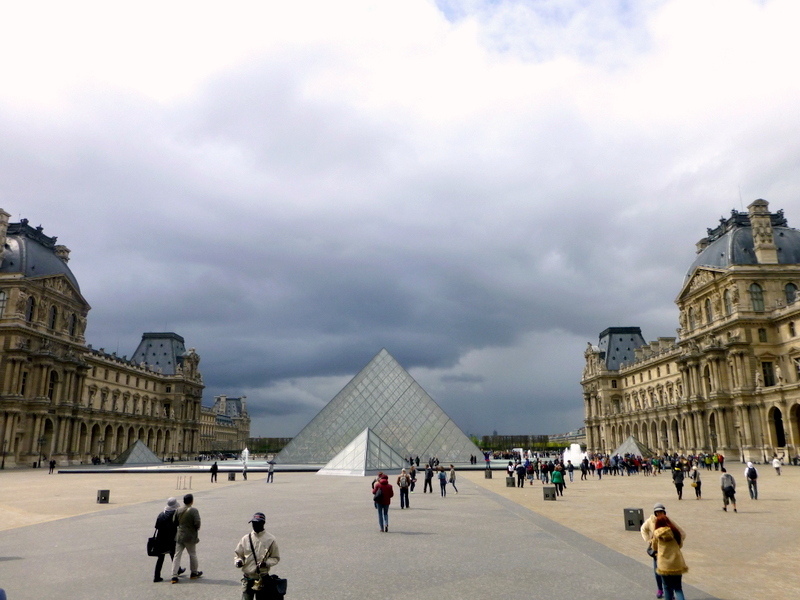 !” Well, in all honesty, seeing the Mona Lisa in person is nice but not jaw-dropping, especially when you have to fight through a crowd of people trying to take pictures with it. In my opinion, the painting directly across from it, The Wedding Feast at Cana by Veronese was far more memorable – and not just because of its size. The painting’s rich colors and complexity is quite amazing; each individual person looks unique. The sad part was that I was the only person looking at the painting for a good thirty minutes. At least admission was free, which you should definitely take advantage of if you are a student under 26. 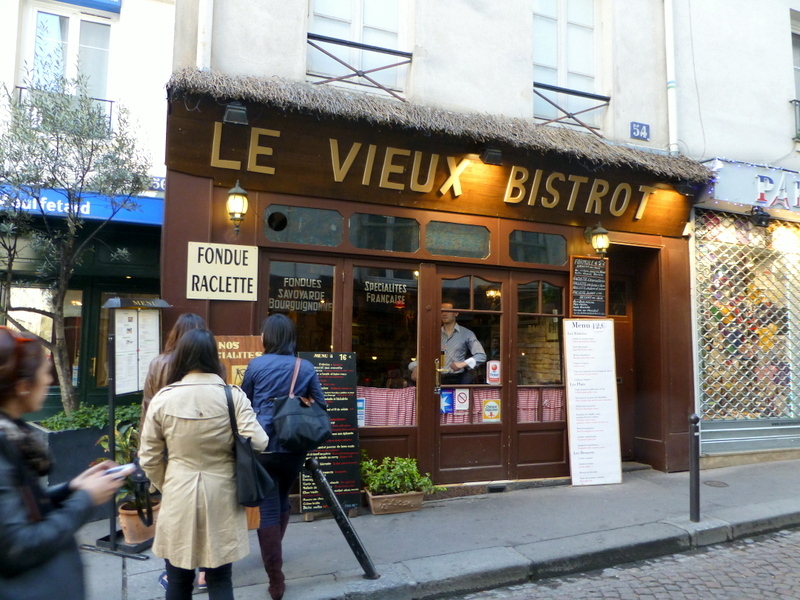 Le Vieux Bistrot is located in Latin Quarter, and it has a cozy character. There are pots, paintings, plants, and a very giant moose head all hanging on the wall. The waiters were also very kind and very generous with the free table bread – which we ate with gusto. One of my friends unknowingly ate a whole basket of bread by herself, leading one of the waiters to joke that he would have to start charging us. And yet, he simply cut another loaf and set the basket right in front of us to resume eating. The restaurant has a pre fixe menu for €15, which most of us ordered. The hot goat cheese and toast on salad was well received. 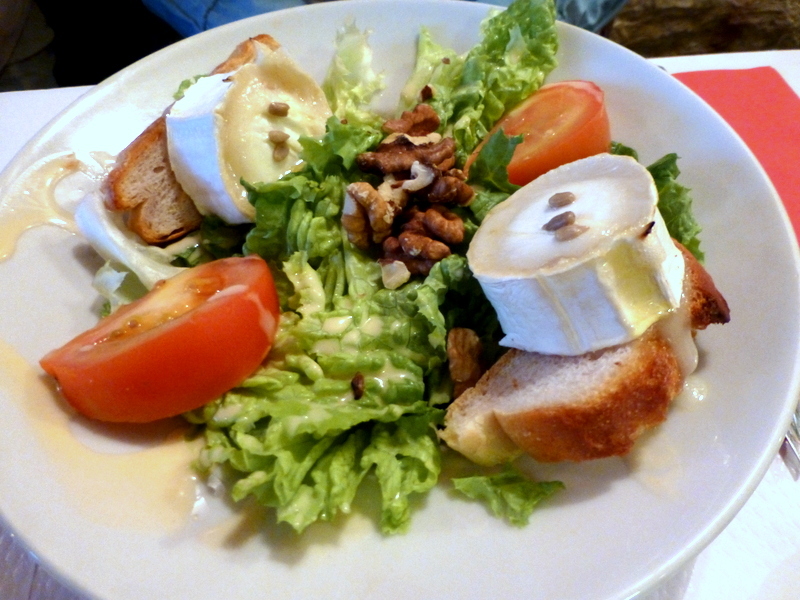 Hot, melty cheese in general is hard to pass up, and the portion of this salad was almost border-line a main course. 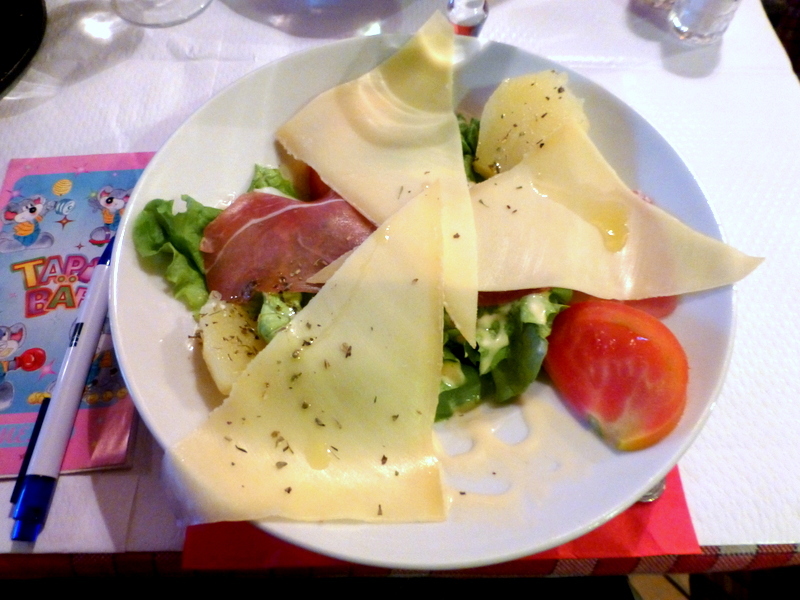 The Savoyard salad came with tomatoes, thin slices of ham and cheese, and potatoes marinated in herbs. It was an interesting combination; some people didn’t enjoy the addition of the potatoes. The soft, mushy texture did not quite fit the rest of the salad. The simple dressing, though, was spot on. 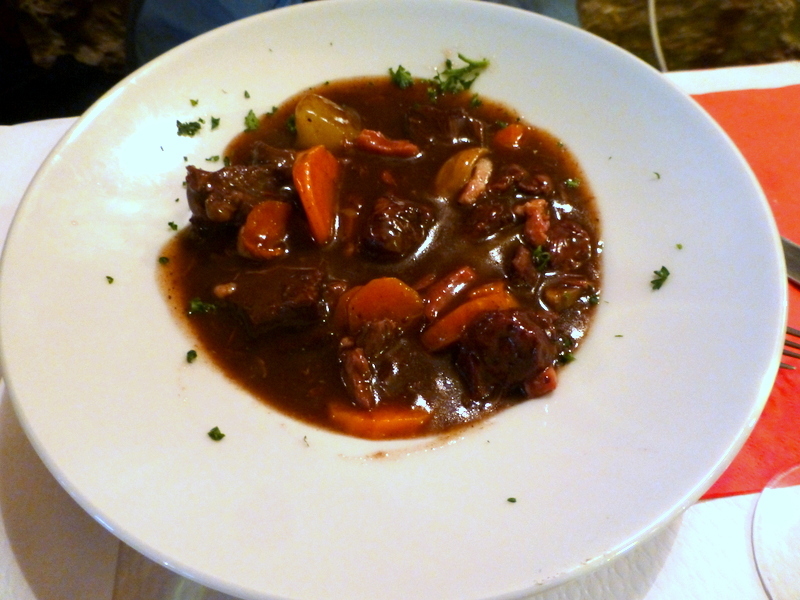 The beef bourguignon was thick, rich, and delicious. Classic French, classic yum. 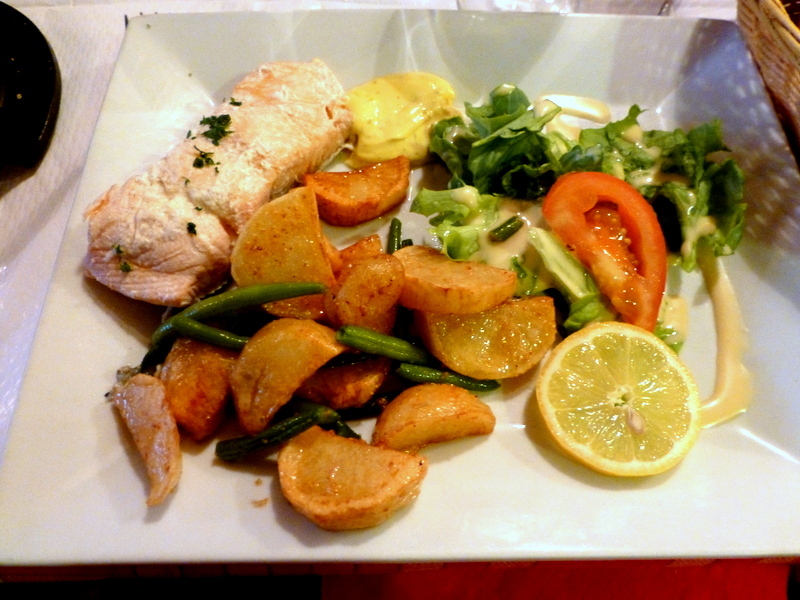 The grilled salmon came with more potatoes and salad. The combination could have been more inspired, and the salmon’s presentation was lacking, but the flavors were there and everything on the plate ended up being cooked well. 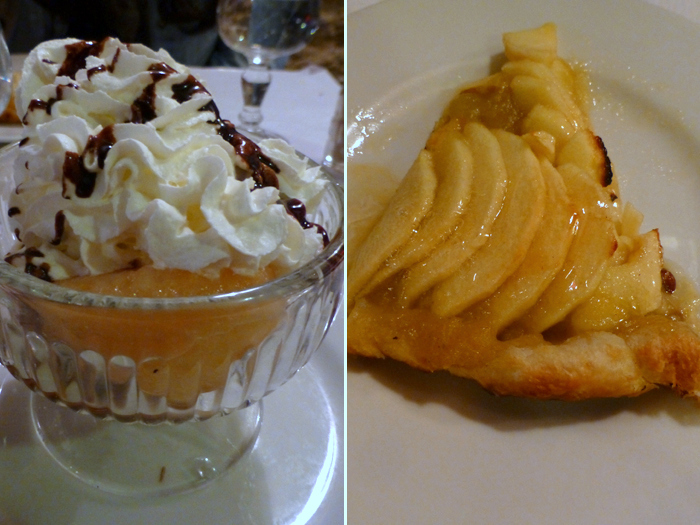 The desserts of fruit with vanilla ice cream and Chantilly cream were nothing amazing but refreshing. The warm apple pie was noteworthy because of the use of puff pastry – a table favorite. The pie had a combination of pureed and whole apples. Not a part of the pre-fixe menu were the cheese fondue and the raclette. The fondue (€15), made with three different types of cheeses, comes with a large basket of bread, potatoes, and a salad with ham and tomatoes. I should mention that you get a lot of cheese for your fondue, so feel free to dip generously. For the price, though, I’m not sure if what you get is worth it, as there wasn’t much protein given. 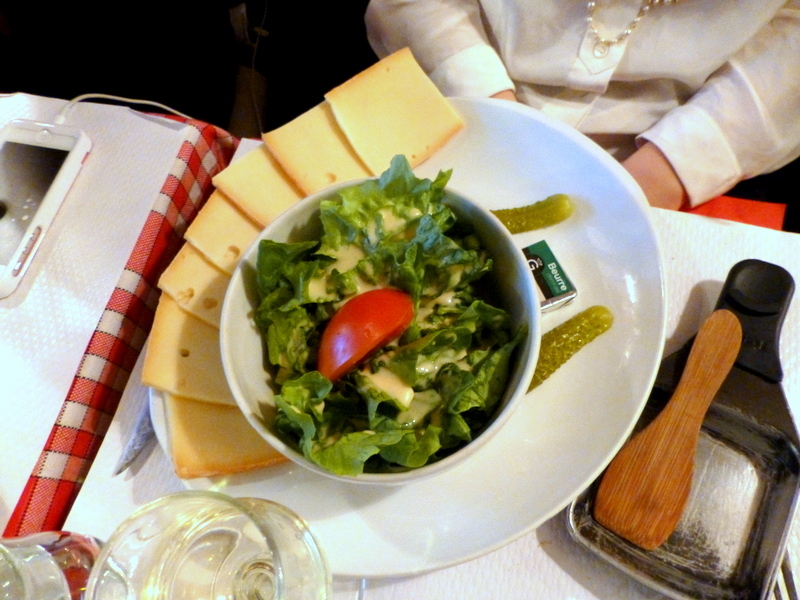 The raclette (€15) also came with a salad, a generous portion of leafy greens. If you’ve never heard of raclette, I highly recommend that you try it one day. You heat up slices of cheese in a little pan under a special hot plate. When the cheese is all bubbly, you quickly pour it over potatoes. Creamy goodness all over the place. 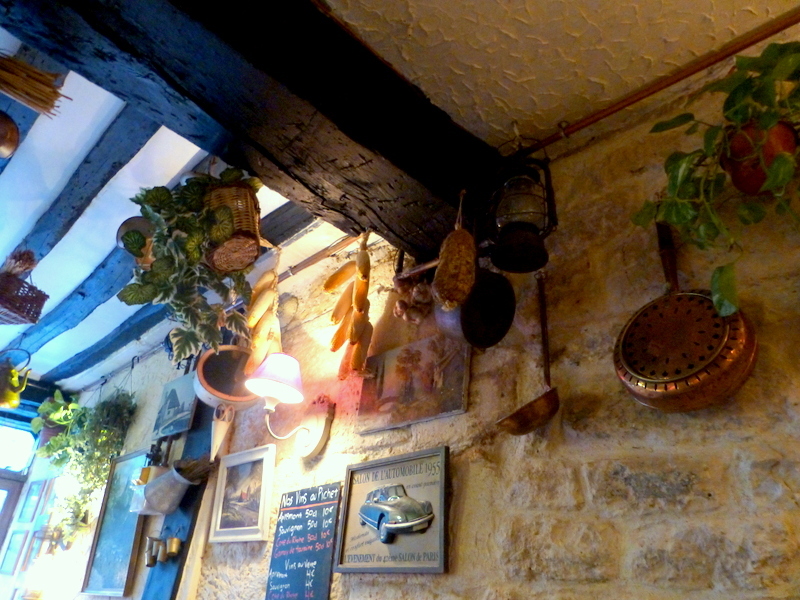 Le Vieux Bistrot is a cute restaurant with hospitable staff. There wasn’t much creativity, but the food was filling and the portions were generous. We thank them profusely for all the bread that they gave us that day without complaint.